Enrico Tettamanti naviga su barche a vela d'altura sin da piccolo, grazie alla passione della sua famiglia. A 18 anni consegue la patente nautica senza limiti, a 19 è istruttore di vela presso la scuola nautica STEFRAL, con sede ad Aprilia Marittima, e sostiene corsi d’iniziazione, patenti nautiche e corsi avanzati d'altura. La sua passione sfrenata per la vela senza confini lo porta, a soli vent’anni, ad affrontare il primo trasferimento in Atlantico, da Malaga alle isole Canarie, via Gibilterra. Trasportato dall'entusiasmo Atlantico rientra in Italia e con la propria imbarcazione, un fast cruiser di 40,5 piedi, inizia a partecipare alle regate d'altura dell'alto Adriatico, sempre con allievi della scuola nautica come equipaggio, e ad organizzare crociere. Henk is Dutch born 1962. He speaks English, Dutch, Friesian, German, Portuguese and Spanish. After graduating he worked for 6 years as a freelance advertisement photographer in Amsterdam. He started sailing at the age of 12 and can look back on 21 years of sailing experience. Here in the south he sails since 1995. While on a sailing trip of two years, he decided to give his nautical life a more permanent footing. The attraction of the extreme isolation and the beauty of unspoiled nature made it easy to take that decision. Skipper professionista, proprietario del Tari II, trentennale esperienza velica e numerose traversate oceaniche, esperto del Mediterraneo, del mar Rosso e Caraibico, conoscitore dell’Atlantico, nell’anno 2000 raggiunge con la sua imbarcazione la Terra del Fuoco ed approda ad Ushuaia in Argentina, deliziosa cittadina australe che si affaccia sul Canale Beagle. Rimane incantato dal magico fascino dei luoghi e decide di fermarsi. Attualmente accoglie sul Tari II coloro che vogliono conoscere i posti dove i grandi navigatori, come Cook, Drake, Magellano e tanti altri famosi, gettarono le loro ancore dopo aver doppiato il mitico Capo Horn. D'estate naviga in Grecia. Austrian yachtsman Wolfgang himself was named after the great composer, he called his first yacht Amadeus so his second, his new ultimate dream catamaran, could really only have one name: Mozart. 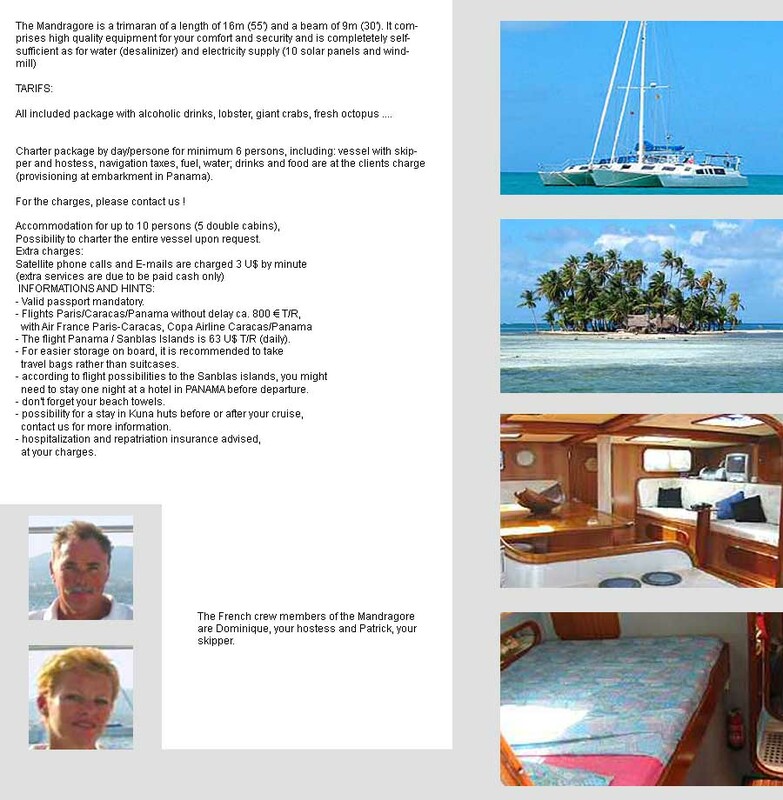 Having sailed, dived and very successfully chartered in Thailand and Burma for some eight years he knows the area like the back of his hand and he will be able to show you, besides the well known famous places, some "secret" spots, unspoiled, usually inaccessible for "normal" mono hulled yachts and stunningly beautiful. Mozart's' speed means you can cover a lot of ground within a short time. This way cruising grounds further away come within your reach, even during shorter charters. Francesco acquired experience on the sea in more than 30 years of sailing, 15 of which with a professional responsibility. A few Atlantic crossings and local knowledge in the mediterranean, caribbean, West Coast Usa, South Africa and Morocco. All courses and qualifications. He's a hands-on sailor with excellent culture (he has a Master's degree in politics), team-management and problem-solving capacities, and he's not ashamed of professional chefs. Several races in his CV. Jacqueline is Swiss, born 1968. She speaks English, German, Spanish, French and some Italian. After graduating she worked as an english and primary school teacher in Zürich, Switzerland for 5 years. Having completed her fith year of teaching, she decided to take a three month brake. As a nature and animal lover, always searching for by humanhand unspoiled places on earth, she travelled to South America and fell in love with it's purness of nature.